If The Life-Changing Magic of Tidying Up didn't work for you because you are not a person who wants to devote their entire lives to organizing stuff; if cleaning seems too onerous because no matter how much you do it, there is always more to be done; if you don't mind a little adult language, then this book is for you. 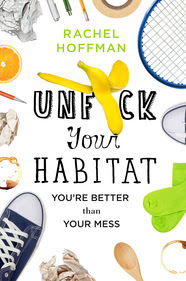 Unf*ck Your Habitat does what I have looked for and not found in other cleaning and organizing books: it addresses your messy habits. I was going to say it does not get into the nitty gritty of how to clean shower grout, but it does that too in the appendix. It makes changing habits seem so doable. The biggest piece of advice it offers is to do cleaning in 20/10 segments. (Almost) anybody can clean for 20 minutes. And then give yourself a reward by doing something you enjoy for ten minutes. That way, if you have a big project to tackle, you can break it up into several 20/10 segments and not get overwhelmed. The ratio of 20/10 is not set in cement. You can figure out what works for you whether it be 45/15 or 15/5. But the break is not optional. So far, I've actually had a hard time following this rule. Once I get geared up to clean, it's hard to stop before the task is complete. But Hoffman points out that marathon cleaning doesn't form good habits. It just gets your house clean every once awhile. And then it quickly falls back into disarray because you're not maintaining regularly. 20 minutes a day is better than 2 days every month. She reminds us, "There is no one alive who is such a great housekeeper that they only have to clean things once ever." One of the mini-challenges given is to spend 20 minutes clearing off the flat surface next to you. Take before and after pictures. When cleaning, it is easy to forget how much progress you've made. Give yourself evidence. I did my nightstand. 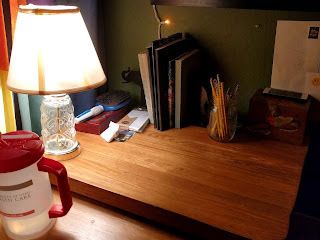 Because it was a cleaning project with such a focused area, the results were very satisfying. This book seems to be geared mostly for college-age folk who have roommates. The book devotes a chapter to dealing with the habits of people you live with, but only two pages to those living with children. 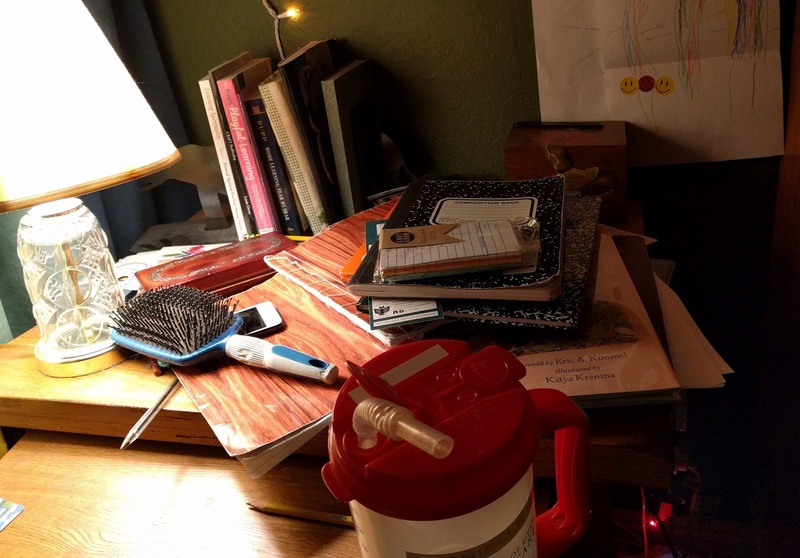 It also only spares one sentence to the "floordrobe," which is where most of our mess ends up. But I still felt like this targeted me more effectively than other organizing books. It's hard for me to rate this book properly without giving myself months to see how it affects my habits. But I loved reading it and it leaves me with hope for transforming my messy habitat.